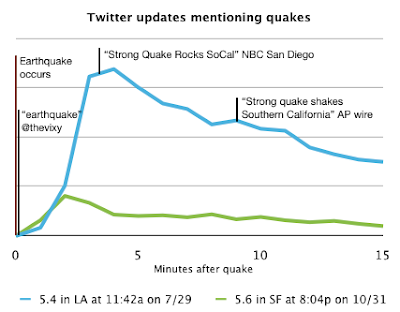 LA Earthquake: Twitter Reports First – Again. Fake Video Caught. Google thinks I am an earthquake expert simply because I pointed out Twitter was the first to report the recent earthquakes in Japan and China. Today the same happened: Twitter was on fire with user reports of the Los Angeles earthquake 9 minutes before the first AP wire came out. It’s an undeniable trend – but is it important? I received some flak in comments to the previous two posts, for neglecting to mention that I was comparing apples to oranges. New agencies have the responsibility to verify information and it takes time. Reliability over Speed. Fair enough. ReadWriteWeb asked the question: Did Twitter Really ‘Outshine’ the Mainstream Press? The only thing Twitter does better than the traditional news is speed. It doesn’t do depth, it doesn’t do fact-checking, it doesn’t do real reporting. It does breaking news, and it does that very well — in many cases these days better than the mainstream press (in terms of how fast it breaks news). Very well said, and I think we need both: speed and depth. Ironically, MG Siegler’s post @ VentureBeat describing twitter’s power in such situations provided an example for the opposite by including what appeared to be the very first video footage of the LA quake. I wonder what this video shows. It’s NOT the building shaking. The movement is too fast, and it’s inside the room, relative to the window frames we see. It looks more like a camera quickly moved left and right. If this was an indication of how the building moved, we’d see a lot less movement behind the window (inside) and a lot more outside. Update 2: The 12seconds vid was fake, posted after the fact, a co-founder of 12seconds confirmed. So there you have it. People do take advantage of the relative naivete of social media and don’t hesitate to post fake news to gain 5 minutes of fame. But that doesn’t undermine the importance of speed, which in some cases can provide early alerts and potentially save lives. We need both. Related posts: CNET News.com, Twitter Blog, Valleywag, Brij’s One More Idea , RexBlog.com, LA Times blog, Live Digitally. the video title used the word “recreation”… not exactly trying to hide it, were they? That’s as misleading as it gets, IMHO. Great summary: we have to stop praise Twitter for its ability to break news faster or to sympathize to AP because they can’t be as fast. We do need both – Twitter for breaking news and mainstream media for in-depth coverage. They do different job and they both do it well. And we in the tech blogosphere often forget that there are lots of people on Earth who still get their news in a traditional way – from TV or newspapers and have no idea of what Twitter is at all. Twitter was buzzing with posts on the recent L.A earthquake nine minutes before AP officially broke the news. This Twitter phenomenon once again proved that unintended consequences are always larger than intended consequences. As we would have never imagined people find amusing ways of using Twitter ranging from keeping buddies updated and getting caught drinking when they called in sick and the boss followed their tweets to ensue wave of media coverage to get out of jail. A recent proposal to use Twitter as an emergency system met with stark criticism citing Twitter’s availability issues. I don’t see this as an “either or” proposition. The answer is “and” and not “yes, but”. Let’s use Twitter for what it is worth. It’s a great microblogging and crowdsourcing tool to tap into the wisdom of crowd with a very little overhead and almost no barrier to entry. Enterprise software should seriously consider this social computing phenomenon and leverage its capabilities by integrating such a tool in their offerings. For instance a social CRM application can use such a tool to help sales people effectively follow, collaborate, and close opportunities. The customer support system can provide transparency into the defect resolution process by service representatives tweeting the progress instead of logging it in semi-static IT ticket systems. Following individual tweets has its obvious advantages but correlating multiple tweets could be extremely powerful and could yield to interesting nontraditional usage models such as using it to run predictive markets, sentiment analysis, or to track a recall on salmonella tainted tomatoes in real-time.